Starfish belong to the phylum Echinodermata. Mollusks are a separate phylum of animals. Although both phyla are made up of invertebrates, differences in their anatomy are why starfish are classified as echinoderms and not mollusks. Echinoderms have spiny skin and many physical attributes that are unique in the animal kingdom. Echinodermata means spiny skin. All echinoderms are marine animals. About 6,000 species fall into the echinoderm category, including all starfish, or sea stars. Sea stars and many other echinoderms have radial symmetry, which means their appendages radiate out from a single point in the center of their body. Most familiar animals have linear symmetry, meaning our right half is symmetrical to our left half. Instead of a brain, starfish and some other echinoderms have a ring of nerves in their central disk, which connects to each of their appendages. Echinoderms move via tube feet, which are part of a water vascular system. Echinoderms take seawater into their bodies, and the chambers in the vascular system expand and contract within the tube feet, allowing the tube feet to grasp or relax and propel the animal along a surface. Over 100,000 species of mollusk live today. Their body structure of a head, visceral mass, mantle and foot distinguishes mollusks within the animal kingdom. All mollusks have some kind of hard shell or protective structure on their body that's excreted by the mantle. Mollusks can be found on land, in oceans and in freshwater systems on almost every continent. Mollusks have bilateral symmetry, meaning a line divided down the middle of their bodies delineates their symmetrical halves. Mollusks have brains or simple ganglia, depending on the animal. Mollusks use muscles to move or they are sessile, meaning they live their lives anchored to one spot. Starfish belong to the subphyla Stelleroidea and Ophiuroidea. Stelleroidea include sea stars and sun stars. Ophiuroidea includes brittle stars, serpent stars and basket stars. They're divided because ophiuroidea have a distinct, round center to their bodies to which the limbs are attached, and stelleroidea do not have this structural distinction. Starfish vary in size and number of arms. Usually the arms are found in multiples of five, but some starfish have arms in multiples of six. 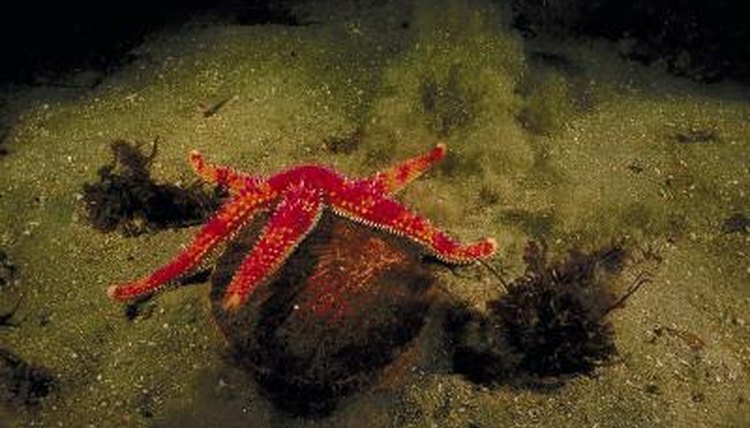 An example of a stelleroidea starfish is the chocolate chip sea star, a creature commonly found in home marine aquariums. Green brittle stars are fast-moving predators that grasp prey with their flexible arms. Many sea stars are slow and hardly move at all, feeding almost exclusively on detritus and micro-organisms they find on reef surfaces. The most common classes of mollusks are gastropods, bivalves and cephalopods. Gastropod means stomach foot. Creatures in this class have a muscular foot they use for locomotion on the underside of their visceral mass. Examples of gastropods are slugs, snails and abalones. Bivalves got their name because they have two hinged shells that protect their soft bodies. The mussels, clams, scallops and oysters that humans commonly eat are bivalves. Cephalopod means head foot; these animals got their name because when they propel themselves through the water they go head-first. Octopuses, chambered nautiluses and giant squids are cephalopods. What Is the Classification for Squids? How Do Tendons Work in Crustaceans? What Is the Meaning of Mollusca?